We expect that Fed policy will continue tightening through year-end, with as many as two additional increases in the fed funds rate in tandem with a measured reduction in the size of the Fed’s balance sheet, but the prospect for a recession is not included in our cyclical forecast. Our expectations are for continued GDP growth throughout the balance of this year and into 2019. Accordingly, equity exposures remain elevated across all strategies relative to our historic allocations, with a 60% growth style bias among U.S. equities. The outlook for the U.S. dollar is path dependent upon the durability of both trade conflicts and Fed posture into and through next year. We retain a modest allocation to gold given the combination of the potential for global political instability and its current price well below our estimate of fair value. Continued tightening by the Federal Reserve, with its two increases in the fed funds rate thus far this year, combined with the gradual reduction in its balance sheet and the gravitational pull of negative yields in much of the developed world have led to a flattening of the U.S. Treasury yield curve. While our view is for continued economic growth until nearing the end of our three-year forecast cycle, we remain wary of the potential for a misstep by the Fed that would lead to excessive tightening and increase the odds of a recession. Though an inverted yield curve is widely viewed as being indicative of an impending recession, a flattening curve is not necessarily a precursor to an inversion. 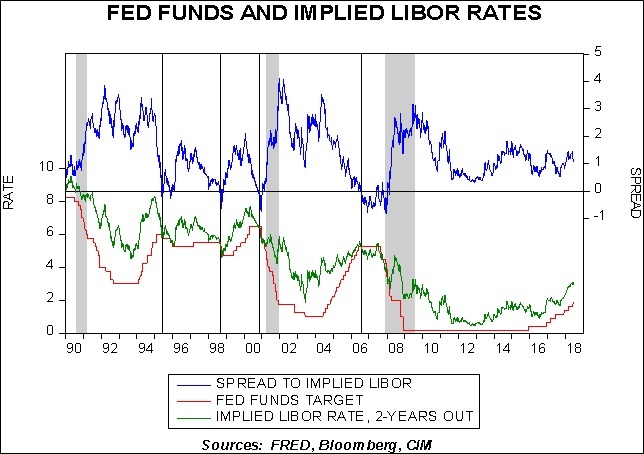 What we have found to be an even more important metric to measuring Fed policy than either the spread between fed funds and the 10-year or the 2/10 segment of the curve is the spread of fed funds to the implied LIBOR rate advanced two years. 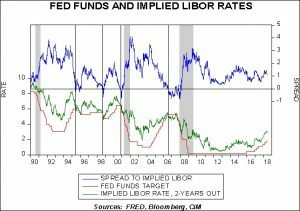 As the accompanying chart indicates, implied LIBOR has increased since mid-2016 and remains comfortably in excess of fed funds. When this measure falls into negative territory, it is a signal from the financial markets that the Fed has overtightened policy. If or when this occurs, it will cause us to reassess the probability of a near-term recession. Until that point in time, we are consoled by the high levels of several sentiment indices, including the U.S. NFIB Business Optimism Index, the Conference Board’s Consumer Confidence Index and the University of Michigan’s Index of Consumer Sentiment. In addition, low unemployment and strong GDP figures compel us to retain equity exposures at their historically high levels for the portfolios until such time that potential risk outweighs expected return. Finally, inflation expectations remain around the 2% level, which creates a stable backdrop for both bonds and equities. While we are cognizant that the mid-term elections in the U.S. may engender fiscal changes that could challenge the economic environment, we find it premature to factor any effects into our forecast. The global economic environment, while still positive, faces a number of challenges. The imposition of tariffs by the U.S. and, as a result, several of its trading partners, holds the potential to develop into a full-scale trade war with obvious downward implications for global growth. Although Europe is still in expansion, the ECB has maintained a dovish stance on rates and has indicated it might forestall a reduction in its balance sheet until mid-2019, citing a moderation in growth in the first half of the year and concerns emanating from increased protectionism. The Japanese economy has similarly exhibited recent signs of difficulty. After eight straight quarters of GDP growth beginning in 2016, the economy shrank in the first quarter. Although it was a modest decline of -0.2%, it echoes the moderation in Europe and encourages the extension of the BOJ’s asset purchase program. Of even greater consequence to the global economic environment is China’s response to U.S. protectionism. We believe China has the will and determination to engage in a full-scale trade war with the U.S. In addition, China may employ any economic weakness accruing from a reduction in its trade to contain its debt growth, which is prominent in Chairman Xi’s economic construct. Given the global dispersion of economic growth rates and central bank policies combined with the potential for protectionism to take hold, we find the value of the U.S. dollar versus other currencies to be on a knife’s edge. Continued U.S. economic expansion and weakness abroad are normally a recipe for U.S. dollar strength relative to other currencies. However, though the interest rate differentials support a strong U.S. dollar and a global trade war would lead investors to seek safety in the greenback, leading to the potential for the U.S. dollar to reach historically high valuations, a more localized trade dispute solely with China would limit the overall economic impact. In the event that the goal of the U.S. administration’s trade rhetoric is simply to improve America’s bargaining position, the U.S. dollar could be vulnerable to a pullback to its fair valuation. If the Trump administration openly opposes Fed policy tightening, then the dollar could be especially vulnerable. Despite trade tensions and the potential for a misstep by the Fed, our views remain favorable on U.S. equities. Our assessment is that inflation should remain contained, the low level of unemployment will persist and GDP growth will be maintained. As expected, the level of share repurchases, M&A activity and repatriation of overseas assets have been elevated since the passage of the tax act at the end of last year. Current readings show no indication of these trends abating in the near-term. 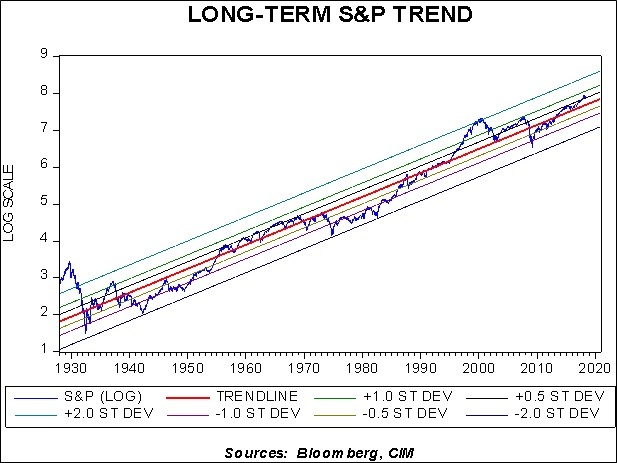 Although equity prices, as measured by the S&P 500, are in excess of the long-term trend, as shown in the accompanying chart, expectations of higher corporate earnings and solid economic data combined with high levels of consumer and business confidence encourage us to retain our historically high equity allocations in each of the strategies. In addition, due to the current stage of the economic cycle, we maintain the 60% tilt toward growth equities, yet without an overt overweight to any particular growth-oriented sector due to potential effects on the Technology and Consumer Discretionary sectors from the upcoming introduction of the new Communications Services sector at the end of September. The overweight to the traditionally value-oriented sectors of Energy, Financials and Materials that have existed since the beginning of the year are supported by attractive valuations and are therefore retained. Mid-cap and small cap exposures have an identical tilt to growth equities and are both overweight in our strategies that have growth as an objective. Outside the U.S., we retain most of the posture from last quarter. The factors discussed above regarding the U.S. dollar exchange rate will naturally create either a headwind or tailwind for returns on non-U.S. equities, but the attractive relative valuations advocate for their retention. The more hawkish composition of voting members of the Fed’s Board of Governors as compared to last year produces the expectation of continued tightening and balance sheet unwinding. Combined with a stable inflationary outlook, this leads to a forecast of an extremely flat yield curve over our three-year cyclical outlook. 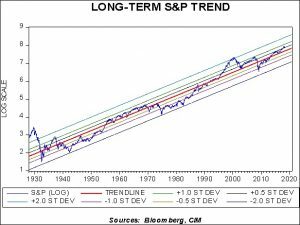 Though this bodes well for the longer rungs on the ladder, as well as the long-term Treasuries employed in the income-oriented strategies, such a flattening will impact the intermediate rungs of the ladder. However, given our outlook for the full three-year cyclical period, any price pressure on the intermediate rungs will prove ephemeral as their roll toward maturity will find them comfortably recovering. 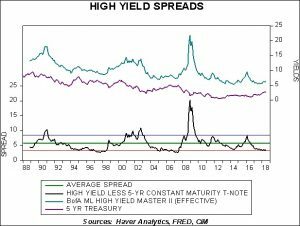 While our view of the bond market is sanguine over the cyclical time frame, we harbor some level of trepidation in the speculative bond space. 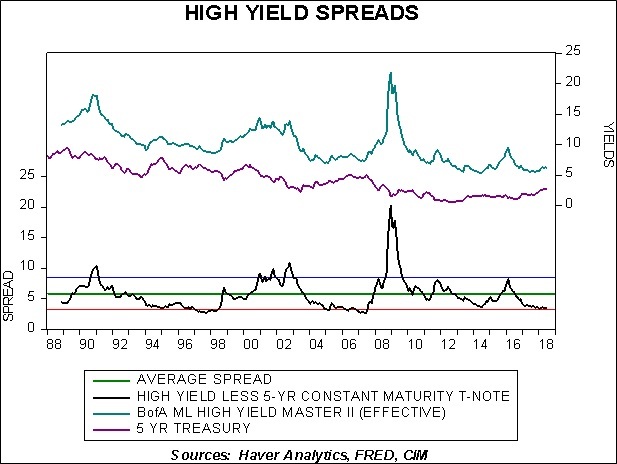 As the chart alludes, spreads are at post-recession tight levels. In addition, Moody’s estimates that $952 billion of high-yield bonds will be maturing between 2019 and 2022, most of which will be seeking refinancing. Coupled with the tax legislation limitation of interest deductibility to 30% of EBITDA by corporations, this may pressure spreads to widen. Accordingly, exposure to speculative grade bonds remains at the low end of our historic levels in the strategies. We retain the allocation to real estate in the more income-oriented strategies given attractive and improving dividend yields. As a function of yield relative to potential risk, we view REITs more favorably than speculative bonds. We also retain our allocation to gold, which was introduced last quarter. Owing to the fact that gold can serve as a safe haven during periods of heightened geopolitical and currency risks, and the knife’s edge of the U.S. dollar’s exchange value, we find the modest allocation to be helpful as a governor of risk. In addition, gold is currently trading well below its fair value price as suggested by our analysis.